Smooth, matte finish. Double-sided color. 100lb+ cover stock. Slightly textured, matte finish. Double-sided color. 100lb+ cover stock. Smooth, high-gloss finish. Single-sided color. 100lb+ cover stock. Shiny with smooth, high-gloss finish or matte with brushed finish. Single-sided color. 100lb+ cover stock. European Stardream with iridescent finish. Double-sided color. 105lb+ cover stock. Smooth, matte finish. Double-sided color. 110lb+ cover stock. Soft felt texture with matte finish. Double-sided color. 80lb+ cover stock. Variety of textures. Single-sided color. 110lb+ cover stock. Bright, smooth, matte finish. Double-sided color. 90lb+ cover stock. Smooth, matte finish. Single-sided pattern with white back. Pattern and color may vary between boxes. 100 lb paper. For Your Party custom Gift Tags are made from top-quality paper in the shape and color of your choice. Colors are coordinated as closely as possible to match our napkin colors, but may not be exact. Tags can be personalized on one side. Tags come with a hole punched in the paper for easy attachment of ribbon or twine. Double-sided bridal satin ribbon in an array of coordinating colors is also available for purchase. Assembly is required with the exception of the Wine Tag, which comes grommeted with attached 3/8" polyester satin ribbon in limited colors. Personalize your Gift Tags with text and illustrations from our extensive, designer-curated collection. With over 100 paper colors, 150 fonts, 50 foil colors and 1,300 clipart images, you can create the perfect party accessories for your event. You also have the option to Upload Your Own Art for a truly unique product. 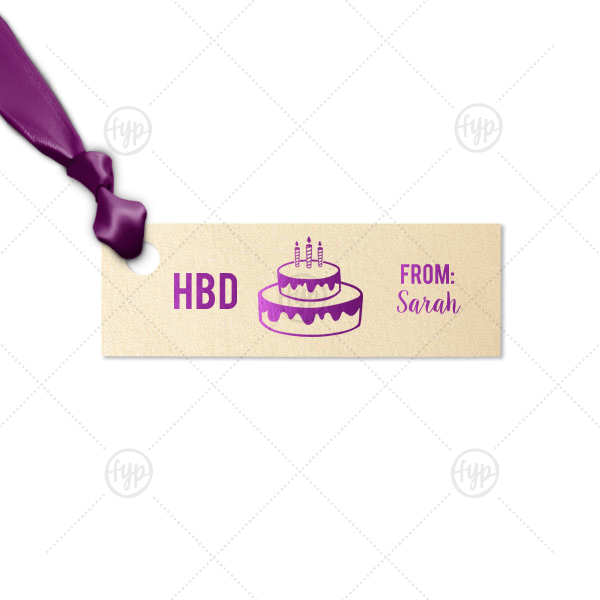 ForYourParty's elegant Stardream Ivory Rectangle Gift Tag with Shiny Amethyst Foil has a Birthday Cake 3 graphic and is good for use in Food, Kid Birthday, Birthday themed parties and will add that special attention to detail that cannot be overlooked. Orders delivered as soon as 05.01.2019. Exclusions apply. Check out our Visual Guide for inspiration. Join our email list and receive FYP news and discounts in your inbox! Celebrate now with 15% off your first order.